Introduction: When I hear the brand PowerBait, I'm reminded mostly of those little jars of bait many of us have used fishing for stocked trout in the many lakes and reservoirs across the country. 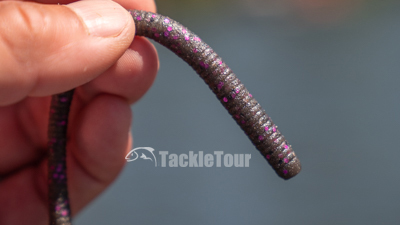 However, Berkley has been making worms and other soft plastic baits for targeting bass probably for just as long. Searching for ways to change things up and try something new, I ordered a few bags of the company's new MaxScent D-Worm for a try. 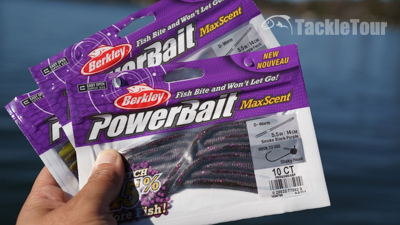 Introducing Berkley's PowerBait MaxScent D-Worm. 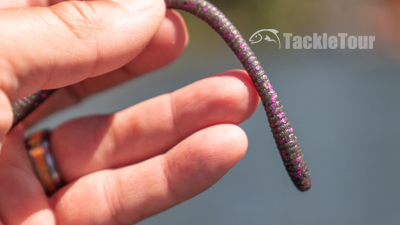 Impressions: Berkley's PowerBait MaxScent D-Worm is in a familiar, straight tail, finesse worm shape and measures right around five and a half inches (5.5") long. They are sold in resealable packs of ten (10) and are made from a very opaque soft plastic/powerbait formula. Some of the ten available colors come with flecks of color resembling large pieces of glitter. Opening the bag of these baits, you are instantly reminded and a bit overwhelmed with that very familiar PowerBait scent. Real World Tests: I've been fishing Berkley's PowerBait MaxScent D-Worm off and on since last Spring from during our tests with Doomsday Tackle Company's BFS stick through our 2018 Spinning Reel Shootout. While there are a few different ways to approach fishing a finesse style worm, my rig of choice was the drop shot. Berkley's PowerBait MaxScent D-Worm is in a familiar shape. 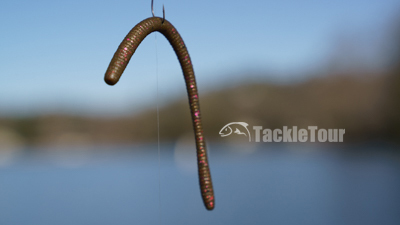 Berkley's soft plastic formula is somewhat dense yet the D-Worm also has a lot of flexibility. 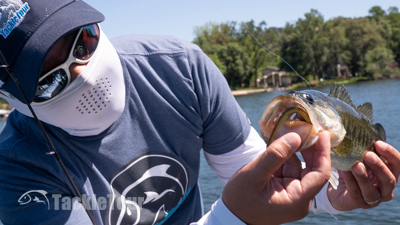 Rigging is simple and straight forward either as a nose hooked bait or wacky rigged. It is just as effective nose-hooked as it is fished wacky. Dropping the bait on the side of the boat to observe it underwater reveals a worm that doesn't really do much until you shake your rod tip. Then it will dance in typical fashion, but don't get carried away. Subtle movements are all that's needed to trigger a strike.